Elisabeth ElliotElisabeth Elliot shares letters, diary entries and recollections of hercourtship and marriage to Jim Elliot. She reveals the temptations, difficulties,victories and sacrifices that she and Jim faced in giving Christ priorityovertheir love for each other. From Revell. The Rules for Christian Singles! Passion and Purity is the beautiful love story of Jim and Elisabeth Elliot, and the classic Christian book on purity. This best seller is perfect for singles of all ages. Author and speaker Elisabeth Elliot's advice helps men and women know how to behave around each other and how to put God first. 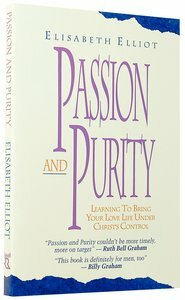 Customer Reviews For "Passion and Purity"
Elizabeth Elliot is always a fantastic writer, speaking with truth and grace. Unlike other books about purity which often include stories of regret, Elizabeth simply shares her own journey and the things that she learnt in the lead up to her marriage to Jim Elliot. Written with honesty and vulnerability, looking honestly at the struggles, this is a fantastic book for anyone trying to find the balance between passion and a pure heart before the Lord. Passion and Purity is just what every girl needs to read. Elisabeth gives readers the an exciting book filled with Godly passion yet filled with Purity so women can truly obtain the grace of God to find the true fullfillment in Christ Alone. One God now and Forever. If I had a lot of money I would arrange for this book to be given to each and every Christian girl as they reach their mid to late teens, and into their twenties. This is rich wisdom written from a deeply personal experience. Elizabeth Elliot is a woman who speaks words that change lives. From her own experience of bringing her love life under the Lordship of Jesus she shares what it means to trust God with our hearts and our future and our choices and our longings and our pain. So much can be learnt from what is in this book for the whole of life, not just relationships. What makes this even more precious is that, after waiting seven years to marry the man she loved (Jim Elliot), a mere couple of years after they married Jim was martyred in South America. You will not regret reading this book whatever stage of life you are at - but it is particularly helpful for young women (and men) who are serious about trusting God with their future.